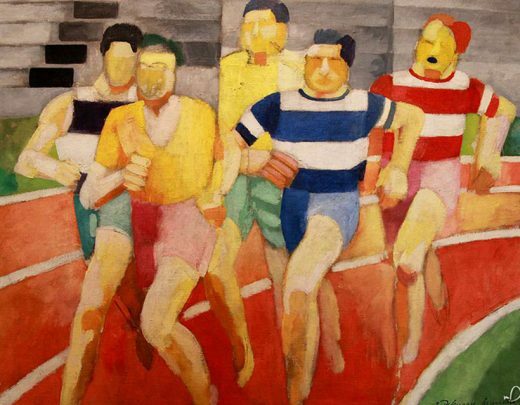 Robert Delaunay's –"Les coureurs:" awards aside, running can clear the head. mong the remaining artifacts at my father’s house in Iowa was my Italian running trophy. It sat on the fireplace mantel. I hadn’t seen it for years. Its base is a heavy pink marble slab, engraved with the following words: Corri Contro la Guerra, 2006. At the time of the race, anti-Iraq war sentiment ran high, and the race was called “Run Against the War.” Many Italians had rainbow peace flags hanging from their windows. The race itself was held in Prenestina, a working-class neighborhood on the outskirts of Rome that I normally only passed through on my way to somewhere else, like the airport. Prenestina always stoked my imagination: I was mesmerized by the seemingly endless TV antennae that poked from the tops of apartment buildings. They looked to me like stick figures, or signs of the cross. 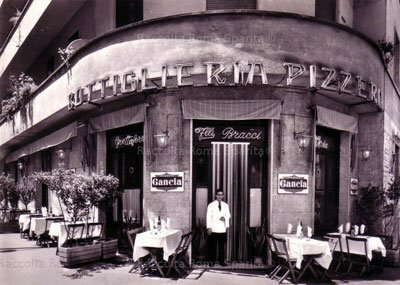 I’d read the poems of poet and filmmaker Pier Paolo Pasolini in college, so I had a certain interest in le borgate (Rome’s slums) and la gente popolare. I don’t remember how I found out about the race, but I went alone, and from what I gathered, I was the only American there. It was a small neighborhood event, and I won easily for my age group and gender category. As shy as I am, I sheepishly went to the front of the crowd when my name was called to claim the ostentatious-looking trophy, with a big, gold-painted cup at the top of the base. I hadn’t planned on keeping it, but when I moved back to America the following year, something tugged at me to take it along. I left it at my parents’ house, and my step-mother recently removed the top part so I could keep the base as a souvenir of my Italian running days. The author competing in the Gargano half-marathon from sea to hills. 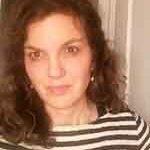 I became a runner in Italy against what I thought were my wishes. My first time running there, I swore I’d never do it again. My Italian boyfriend Giuseppe was an avid runner, and on our first vacations together, in Molise, we ran up a hill so steep that even the Fiat 500s seemed to barely chug up it. I quit early, dashing down the hill, and back into the bedroom of the house we were renting. “You did that to humiliate me!” I shouted at him. Perplexed, he tried to snuggle me. After some easier runs, I warmed to running, and was soon at it all over Rome, and Italy. We spent many Sunday running around Lago Albano, collapsing happily on the banks afterwards, the sun pleasantly warm on our faces. We’d get a late lunch of porchetta, cheese, olives and bread from a food truck overlooking the lake, along with a bottle of bubbly Lambrusco. Like many people, I ran to eat. That was easy to do in Italy. One particularly indulgent race in Emilia Romagna, which played Giuseppe Verdi’s music as we ran through his hometown, had snack tables with chunks of Parmesan cheese and mortadella, and Nutella to smear on fette bicottate. At the post-race feast, we drank from barrels of wine. Eating aside, I discovered other compelling reasons to run: to clear my mind and find my peace, to focus and explore. I always ran without music, since running was a wonderful way to stay in the present, and take in new places unfiltered. I probably never would have appreciated the plains of Alessandria, the steep hills and Baroque majesty of Ragusa, or the elegance and decay of Catania, had I not been on foot. I met a lot of great people along the way. Running typically attracts positive and fun-loving people. One such character was Renato, a retired muratore, or bricklayer, who lived in Prenestina. He took up running after his wife died, and he trained by running in circles around an open field. He had the face of Rembrandt and the childlike spirit of a jester. Little things excited him, like a new pair of running shoes. Un paio di scarpe, he said, pointing at them. Running shoes aren’t cheap, and I remember thinking that his new shoes were a big deal. Renato wasn’t at the race I won in his neighborhood, but he might as well have been — as a triumphant reminder that running helps you move through life, provided you have some gusto — and a good pair of shoes.